Oh Boy! It's Mickey Mouse in One of His Finest Roles! Can you believe that Walt Disney's beloved mouse has been around for almost nine decades? Ever since his debut in "Steamboat Willie" back in 1928, Mickey Mouse has enchanted and entertained kids of all ages through screens of all sizes. However, in the midst of all the brilliant stories and characters created by Disney since then, it can be easy to forget that "it was all started by a mouse." Enter the New Zealand Mint's beautiful Mickey Through the Ages series -- highlighting some of Mickey's best screen moments from the early days of not just Disney, but of the art of animation as a whole. GovMint.com is proud to present the Brave Little Tailor Proof -- the second installment of the Mickey Through the Ages series. 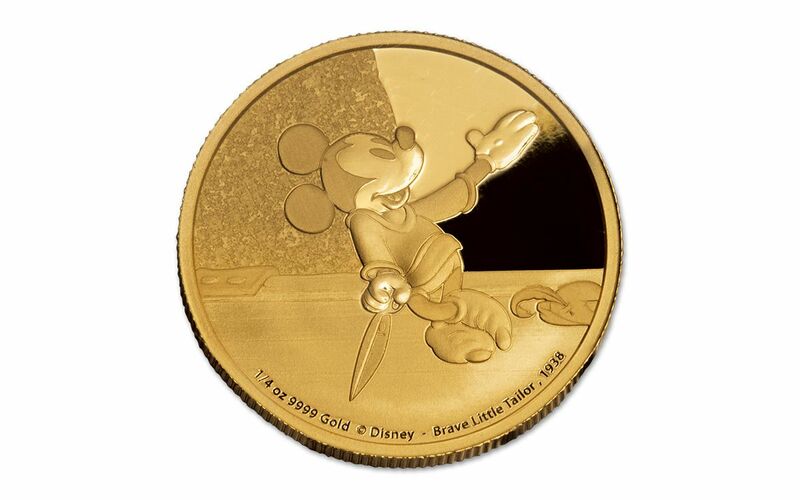 This 1/4 ounce Proof, struck in 99.99% pure gold, features Mickey as he takes his applause from the King's court after telling his tale of how he struck down "seven with one blow!" Unfortunately, Mickey is talking about how he brought down seven flies with a swatter while everyone else thinks he's talking about seven giants! With the kingdom facing a "giant" problem of their own, Mickey is proclaimed the "Royal High Killer of the Giant." And, while terrified at first, Mickey accepts the task with its reward of six million Golden Pazoozas and the Princess's hand (who just happens to be Minnie Mouse)! While Mickey does eventually find the giant, he's almost eaten, drank and smoked in the process -- eventually taking the giant down with a bit of tailor-based skill. Looking at the short today, you would think it was produced just a few decades ago rather than back in 1938. The use of animation in showing quick motion, light, shadow and vibrant color is just a few of the reasons why it's so highly regarded by fans and artists today. Using selected gold planchets and specially manufactured polished dies, your Brave Little Tailor proof will shine with beautiful frosted details and gleaming mirrored fields. The other side of the Proof depicts Ian Rank-Broadley's profile of Her Majesty Queen Elizabeth II. 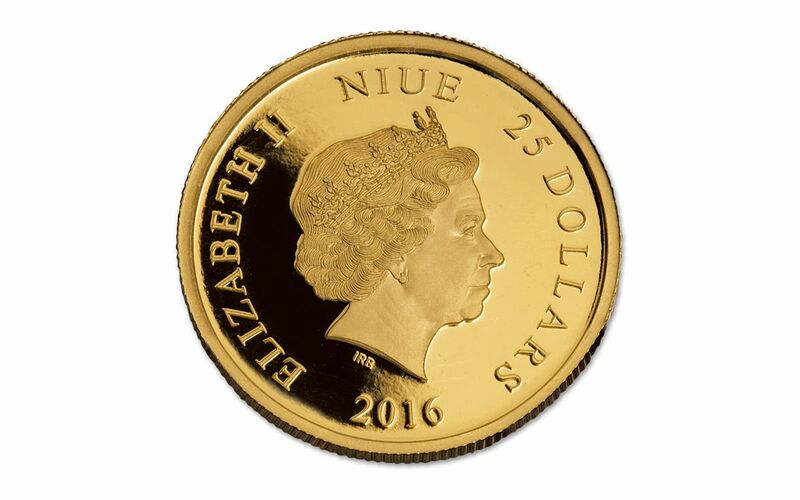 Since your Proof is legal-tender for the island nation of Niue, it also has the denomination of "25 Dollars" engraved alongside the Queen. 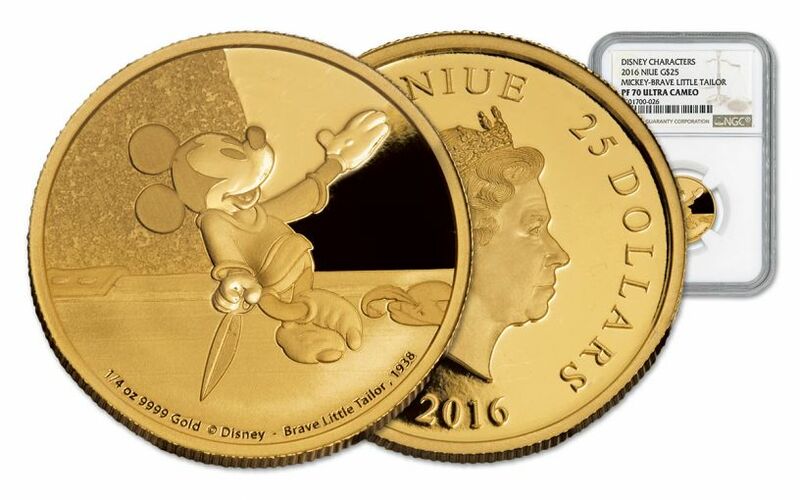 Your 1/4 ounce Mickey Mouse Brave Little Tailor Gold Proof also comes with other swell features! 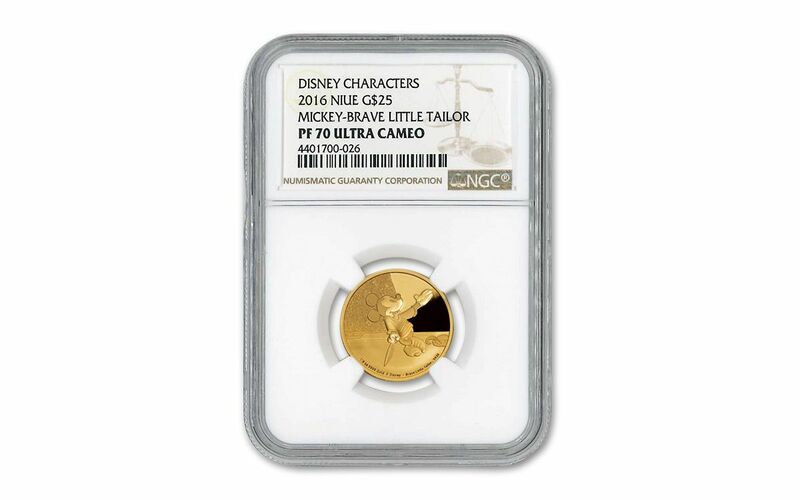 Your Proof will be graded Proof-70 Ultra Cameo (PF70 UC) by Numismatic Guaranty Corporation (NGC), a distinction that means your perfectly-graded coin will showcase deeply mirrored fields and frosted details that are above and beyond the quality of other proofs -- all in flawless condition! Your coin will be sonically sealed in an acrylic case -- giving you the best in protection while giving you clear sightlines into every beautiful detail -- and presented in crafted wooden presentation box. In addition, you'll receive all of the mint's original colorful packaging along with a numbered certificate of authenticity. Don't wait too long to get yours -- only 1,000 will be minted for Disney and Mickey fans worldwide. There's no time for delay and no giant to slay, make this Brave Little Tailor a part of your collection today!